Everyone knows about costs and benefits of doing something – the pros and cons of making a choice. Marginal benefit and marginal cost are different – they look more closely at doing slightly more or less of different alternatives. Marginal costs and benefits are extremely important to producers when choosing their inputs and prices. “Marginal” benefits and costs are a core concept in economics used to find everything from the number of iphones produced to how many roads are repaired! When we use the term “Marginal”, it usually means doing one more of something. For example, a marginal cost would be how much it would cost a company to produce 1 more of a good. Their marginal benefit would be the extra revenue they get from producing that one extra good. Knowing this is important because it helps producers determine the total quantity they produce, and at what price they list them for in the marketplace. Producers create goods and services through a combination of capital goods (like machines and computers) and labor (workers they hire). In the short run, producers cannot add capital, so when a producer is deciding how much goods they will produce next month, they assume their total capital is fixed – all they can do is hire more workers. Unfortunately, just doubling the number of workers you have will not double your output. As a business adds more workers, but keeps their capital constant, at first the workers will become more efficient (able to effectively divide their labor through specialization, and more effectively able to use the capital goods). At a certain point, though, each additional worker you add will make the average output per worker start to fall. Think of it this way: Imagine you are running a farm growing carrots, and you have one truck that you use to bring the carrots to the market where they are sold. You can hire workers to help you dig up the carrots, wash them, and drive them to the market. This works well – with your first four workers, each person makes the whole process more efficient, and now the truck is being used the full time. When you start hiring even more workers, though, your truck will eventually hit its capacity to carry and move all the carrots, and so people will need to wait for you to get back and reload. The more people you add to the work force, the more time will be spent waiting, since you can’t speed up the truck. When workers are waiting, that means you’re paying them while you aren’t getting any extra work done, so everyone is less productive. This same relationship, where labor reaches the productive limits of capital, creates a U shaped curve when we look at the average cost of production. At first, your average cost goes down rapidly – this is when you hire your first workers. This period, where the average cost is decreasing, is known as Economies of Scale. 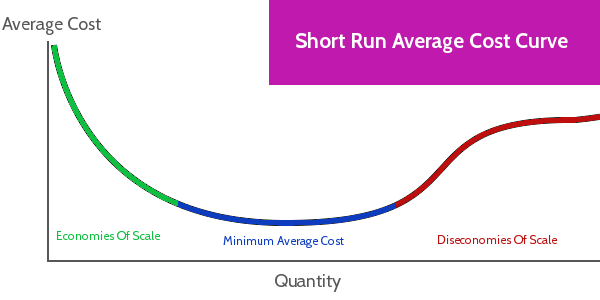 In the middle, there is a long flat area where you are near your minimum average cost. This is the area where the truck is working most of the time, but you can still pack in a few extra carrots on the truck each time it goes. As you get farther right, the average cost starts going up. This is where you have workers waiting to use the truck. This area is called “Disceconomies of Scale”. Marginal Cost has the same kind of relationship – as you increase your production, your marginal cost will go up (how much it costs to bring one more carrot to market). 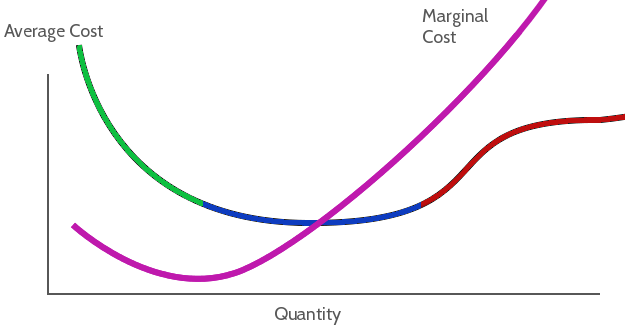 In fact, the marginal cost actually starts going up before the average cost, and they share an interesting relationship. 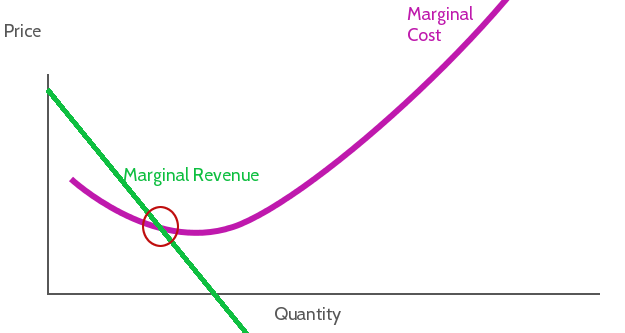 The Marginal Cost curve will always intersect the absolute minimum point of the average cost curve. This relationship is useful – when an economist wants to calculate the minimum average cost, all they need is a formula for the average cost and marginal cost, and find the quantity where they are equal. The “Marginal Benefits” are the extra benefit that a producer gets from producing one more unit of a good. For businesses, this is also called the Marginal Revenue. 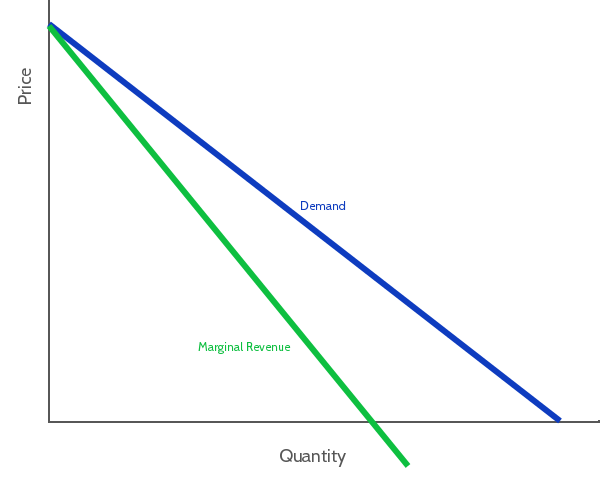 The Marginal Revenue curve looks very similar to the Demand curve, just slightly steeper. This is because for each extra unit a business sells, the less revenue they get for each because they need to keep lowering their cost to sell everything they produce. Economists use calculus to calculate the Marginal Revenue and Marginal Cost, and set them equal to find profit maximization points for production! This is because of how marginal revenue and marginal cost work. If the marginal revenue is greater than marginal cost, a company will make a little bit more profit by producing and selling one more unit. If the marginal cost is greater than marginal revenue, the company is making a loss at their current level of production (selling goods for less than the additional cost of making it), so they will reduce their production. This works because demand is figured in to the marginal revenue. This also means that companies use their “Marginal Cost” curve as their Supply Line, so this relationship is the exact same as you see with normal Supply and Demand curves. The relationship between marginal costs and marginal benefits is also extremely important when governments and voters determine how much, and what type, of public services are provided. Generally speaking, governments are constantly adjusting how much spending they put towards different programs. This means that when they want to allocate an extra $1000 between 10 different programs, they need to measure the marginal benefit that $1000 will bring to each. 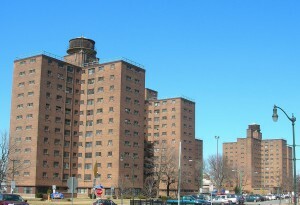 For example, it is currently possible for the governments in most cities in the United States to completely eliminate homelessness if they applied 100% of their city budget towards building new homes for the poor. The cost of this would be every other program, from water treatment, to police forces and fire departments, and schools. The primary job of elected officials is trying to find which programs will get the greatest marginal benefit from an increase in spending, and which programs have the lowest marginal costs from a decrease. If the net benefit to the voters can be increased by transferring resources from one program to another, that is what they usually try to pursue. Actually calculating these benefits and costs can be much more difficult – a difference in opinion over what programs produce the largest marginal benefits and which are sources of the biggest marginal costs is the biggest issue that divides voters between candidates. 1 of 3) What do producers use when choosing inputs? 2 of 3) Why is the marginal benefit and cost important to government programs? 3 of 3) Which branch of math can be used to calculate marginal cost from an equation?